Today is reveal day for The Secret Recipe Club. 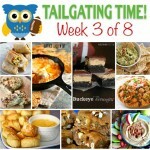 It’s a group of bloggers who once a month post a recipe they’ve been assigned from another blog. It’s a great way to show blogger love and you all know how much I enjoy that. This month I was asssigned My Fiance Likes It So It Must Be Good. I was thrilled to get this blog. I adore Peggy and she is an amazing cook so I knew I would have endless recipes to choose from. 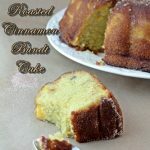 I picked her Cinnamon Pull Apart Bread as I’ve never had or made this stuff. So right away it drew me in. Hers looks way better than mine so be sure to stop by and check it out. Poke around her blog a bit. You won’t be disappointed. In a large bowl combine flour, vanilla sugar, yeast and vanilla salt. Divide in half. In a small bowl whisk your eggs. In another small bowl melt butter with the milk. Add water and the vanilla after and mix. Pour milk mix into the flour. Add eggs and stir. Now add the rest of the flour in small batches until a ball forms. Grease a bowl and pop your dough in it. Cover and let rise for one hour. Deflate dough and knead for 2 minutes. Roll out to about 1/4 to 1/2 inch thick. Make your filling. Mix your dry separate from the butter. Don't add butter to the dry. Brush butter on the dough. Then sprinkle with sugar/cinnamon mix over top. Use a pizza cutter to cut the dough into slices that will fit into your loaf pan. Stack in groups of 6 and set in pan. Grease a loaf pan and stack the pieces in until it's full. The only thing I changed was using vanilla sugar instead of regular sugar. And vanilla salt instead of regular salt. Peggy adapted her recipe from Zoom Yummy’s recipe. I hope you liked this recipe. Now that I’ve tried this stuff I may never stop eating it. I would roll my dough out thinner next time though. I think I went a little thick. I’d also stack them a little less uniform. Looks cooler that way. I could eat this stuff for breakfast, lunch and dinner. It’s that good! Have a lovely day and make sure you stop by the other SRC members to see what they’ve whipped up this month. Looks terrific! But you haven’t saved very much for me! Fun recipe – thanks. Lol, I get all greedy and stuff. Thanks so much. Yes! 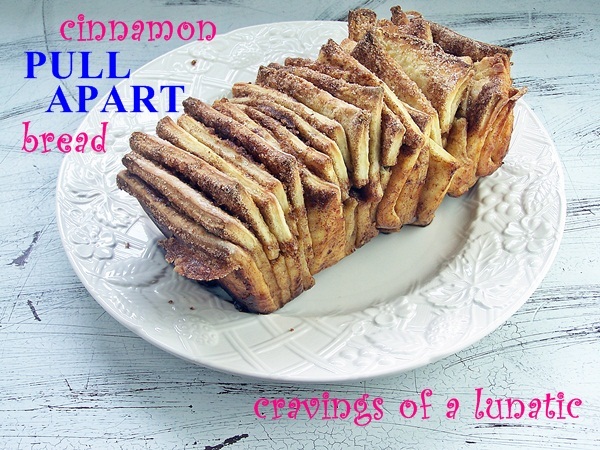 I’ve been dying to try this cinnamon pull-apart bread. It just looks so neat and obviously I’m sure it is delicious too! Great choice for SRC. It’s really good. You will love it. It would make a great dish to bring to a brunch. Thanks so much Rachel. You must try it out. I bet you could bling this out big time. It’s such a cool concept. My wheels are spinning with ways to change it up. Oh man, that looks amazing. You certainly did the SRC justice today! Oh my WORD! Amazing. I think this will go on my Mother’s Day breakfast item wishlist. I had so much fun making your parfaits for my SRC post! Now I want to try them in every see-through container imaginable. I ate 3 of them all by myself. Tsk, tsk! It is so good. I can’t stop eating it. I am so glad you enjoyed them. I love what you did with them and your photos were fab. I think anything in a jar doesn’t actually count as calories. That’s my story and I’m sticking to it. Ohhh I love Peggy’s blog! You nailed her cinnamon pull apart bread, Kim! Aw thanks Tina. I was so thrilled to get her blog. This bread is sinfully good. I so wanted to make that before I went gf. I still may for the family. It looks SO darned good with all of that sugar and cinnamon just about dripping off the slices. Is there a way to do it gf? I should check my gf cookbooks for you. Your kids will go nuts for this one. You must try it. Your pics are looking so great! and so is this bread. Thanks so much Jackie. I had trouble last night with an ice cream shot. I need to paint the blog room. Getting weird bounce back light from the burgandy in the room. Need to paint the room white. I abhor white though. Lol. Oh my, this is quite the loaf! I’ve never made pull apart bread, this one looks like a great place to start though. It is so good. I was so surprised how moist it is. Loved it. You gotta try. I’ve always wanted to make pull-apart bread. This sounds so sinfully wonderful! Great SRC recipe. You must try it out. It is so good. I am in love with it now. Wheels already turning about other things I could make pull apart. I feel like this must be the soft, pillowy version of my favorite Stacy’s Pita Chips. The hardest part about baking any bread has got to be waiting for that rise. I want to eat it NOW. I’ve never had Stacy’s Pita Chips so not sure. We have crappy snack options in Canada I swear. I know right. I was dying while it rose last night. And smelling it while it’s baking is torture. Lucky you, getting Peggy’s blog this month… she’s one of my favourites, and I was so lucky to have her a couple of months ago (in fact, this recipe was one of my potential picks, though I ended up going with something savoury instead). It is SO good. I am addicted to this bread. It’s so good. I adore Peggy, she is an amazing cook. I think of myself as a savoury gal but clearly I’m delusional cuz I always go for sweet. Lol. It is such a cool recipe. I was stunned by how cute it is. Then you taste it and it’s like “bam” beyond tasty. I shall meet you at the arm wrestling table in 5! Wow, what a cool recipe! Nonsense about yours not looking as nice; I think absolutely gorgeous! I don’t blame you for labeling all the pieces yours; I’d want it all to myself too! Great job, Kim! Thank you so much. I have learned if I don’t label things the kids eat it all. So I’m turning the tables on them these days. Awesome SRC pick and I love her blog!! I have been dying to make a cinnamon pull-apart bread and this is making me want to pull out my flour and sugar right now. You must try it Katherine. SO good! Oh my gravy. I have everything to make this but can’t decide if that’s a bad thing or not. I am sharing this on my Facebook page. Thanks so much. I say it’s a good thing. Go forth and make pull apart bread. I have seen this a ton of times and haven’t made it yet, but we all love cinnamon rolls, so why not? Must make. We’re having breakfast for dinner. This might just have to be dessert (if I get to it right now)! Great post! Thanks Katrina. I always held off making it but glad I finally gave in. It’s super good. You’ve outdone yourself again. Mmmmmm. I’ve only ever seen the bread made with little balls stacked in a bundt pan and have often thought I’d never get through the whole thing before it went bad. This looks like a fantastic alternative. Thanks. I have seen it like that too, is that monkey bread or something? Tastes so amazing. Looks incredibly yummy!! Good choice Kim! this is so awesome, Kim! I have wanted to make it for so long. now only if we were neighbors! Thanks Cassie. It is really good. One of us should move asap. You must. It is delish. 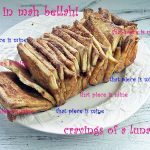 I love this recipe….. But hate being allergic to cinnamon! Love love LOVE your pic claiming all the pieces…. It made me giggle! I could do a nutmeg or apple version for you when you visit! I do tend to be a piggie about baked goods. Mothers day recipe? I think so! My mom would be pretty happy that for a brunch! That is… as long as I do the dishes afterwards as well. That part is pretty key. You must. Your mom would love you more than usual. Thanks Meghan. It is wicked good. I’ll be tweaking this and making it again and again. SO good! Pretty much how my day went. I love Peggy’s blog, too!!! And I’m drooling over your selection!!! I made this eons ago, but must try again…yours looks spectacular, Kim!!!! Thank Liz. It really is incredible. Should have tried it eons ago. Anyhow this is a delicious one for SRC and probably one that has long since been eaten! I can’t wait to make this. My kids are going to LOVE it! So good Debra. The kids will go nuts for this. This looks amazing!!! 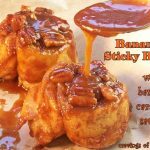 Sweet and sticky and bread. Love it. It is so yummy. You would love it. Omygosh. YUM. yum. yum…yum… I don’t really know what else to type. yum. 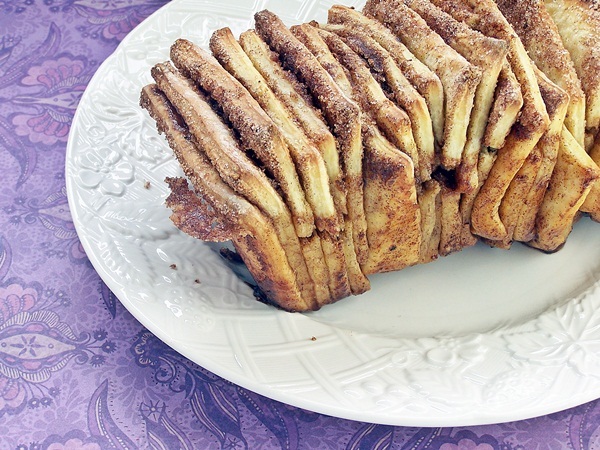 I just fell in love with all of that buttery cinnamon sugar, I’ve never seen a pull apart bread like that, Peggy is a genius, this looks soooo good! Thanks. It really is delish. And yes Peggy is a genius. An evil, cinnamony genius at that. I am dying over that cinnamon and sugar creation. Yum and yum. I wish there was some waiting for me tomorrow at breakfast. I wish you could come over and share some. It’s so good. I know right! I’ll pack immediately and meet you somewhere tropical. I tend to be a spaz. Apparently I grow on people. Lol. Absolutely new BBFF’s (best blogging friends forever)! Oh this looks so amazing. I have been wanting to make this for ages. Must. Make. It. It is so good Marina. Your girls will love it. I would glaze it though. It reminds me of cinnamon buns so I missed the glaze on it. Hubs liked it without. Thanks so much April. I was really surprised. Oh my goodness … must make this … now! 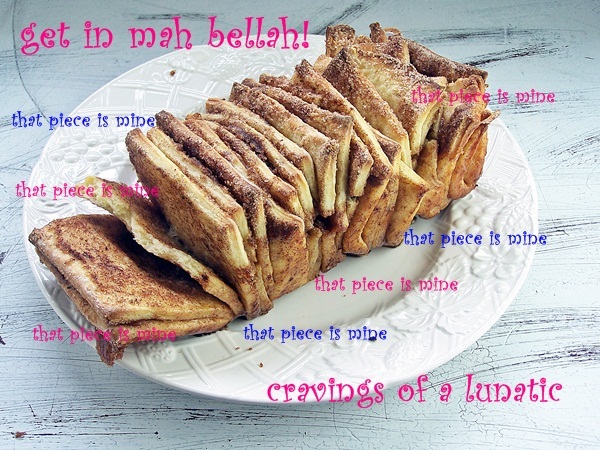 I love a simple piece of toast with butter and cinnamon & sugar … I can only imagine how good this must be! Thanks. It’s really good and really addictive. Wow! That picture is breathtaking and I am dying to dive right into that! Pretty much what I did. Dove right in and didn’t want to come up for air. Oh wow your bread looks so good!!!! 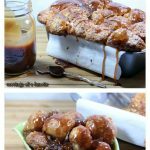 I’ve never made a pull apart bread, but they look so fun! And I love anything with cinnamon! Thanks. You should totally try it. It’s so delicious. The first time I heard of pull apart bread was a couple of months ago. I still haven’t tried baking it myself but I love the idea of it. Yours is the first cinnamon and sugar recipe I’ve seen – this is definitely the route I’d go. 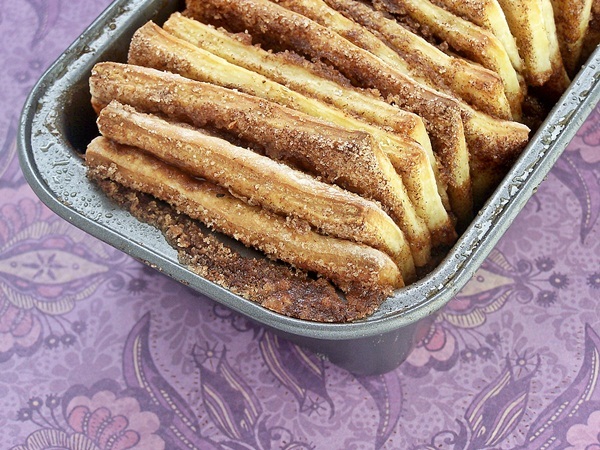 I’ve always been all about cinnamon and sugar toast, even as an adult. Looking forward to trying it! It’s so good Julia. 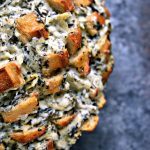 I hope you got a chance to give pull apart bread a whirl. Thanks Mellissa. I have no idea why I didn’t see this till now. This would be super yummy with raisins. 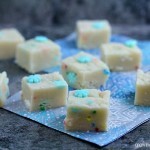 I am wondering if I could recreate with frozen bread dough to save time? I say absolutely try that. I love that frozen bread dough. I used to use it for pizza dough all the time. I always let it rise again though so try sticking it somewhere warm for a bit before you roll it out. I’d love to hear how it works. Girl, you are so hilarious! I love the last pic! Thanks lady. Except I lose comments occasionally. Ha. Sounds good and I’d like to try it, but I have a question. What is vanilla sugar and also vanilla salt?? Never heard of either one of them before?? the box, how do I determine the amount of vanilla to add to the recipe ingredients. Hi Pat. Just use the amount stated in the recipe. Adding the vanilla salt and sugar just amps the vanilla taste up a bit. If you want it more vanilla-y (not technically a word but I’m rolling with it) then I’d add an extra 1/2 teaspoon of vanilla to it. Hope that helps. It’s really good bread. I could not stop eating it when I made it. salt and how much vanilla? I have no idea, I make it bulk. It would be immeasurable really. Vanilla sugar and salt are flavoured by using vanilla beans. They are not salt and sugar with vanilla extract poured into them. If you do not have access to vanilla sugar and vanilla salt just regular sugar and regular salt. My recommendation is still to use the exact same measurement of regular salt and sugar. It would just have less vanilla oomph. Or add an extra one half of a teaspoon of vanilla extract to the recipe to get the extra vanilla flavour that you would get from using vanilla salt and sugar. Hope that clears it up. Just measure out the same way the recipe is written whether you are using plain sugar and salt or vanilla sugar and vanilla salt. You are very patient. Thanks for the clarification. I am very anxious to try this.